Pack it up, take it anywhere--finally there's a party game everyone can enjoy! Satisfied customers play this with their families, with their Sunday School classes and with their in-laws. It gets everyone laughing and talking. We've been told it's been more entertaining than Apples to Apples! Some say it's hilarious, some say it's a great conversation starter. We say check this game out and see how it works with your group! What's It To Ya? asks one simple, very BIG question: WHAT MATTERS MOST? Learn to play in less than a minute. You can play for a couple rounds or a couple hours. With three simple ways to play, it's great for a group of friends or as an icebreaker for total strangers. It's also perfect for holiday parties with the family! Still not sure if What's It To Ya? is the game you want? Check out this video explaining how to play. See how hilarious the game can be! Read the review from BellaOnline here. "Inside of 2 minutes it was hard to keep track of what your partner was saying due to all the laughter and comments from the other teams." "...destined to become a classic..."
"...a fabulously simple social game." "Excellent party game with plenty of laughs." "...could lead to some thought-provoking discussions." "This went over very well for a group of non-gamers." "It is excellent to use with high school kids." And if that doesn't sound good enough, the game is back in print and it's better than ever! It has a new box, new artwork and more cards, but It's still the same great game that makes for many laughs and a lot of conversation. Players compete by predicting how their partners will rank five items in terms of importance. You'll get frivolous items like Tanning Salons, Hairspray and Soda, but you'll also have to decide between things like Hope, Peace and Justice. 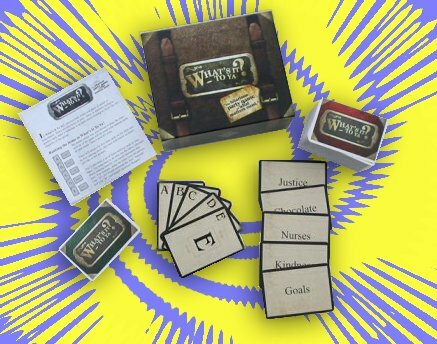 Express yourself and find out what your friends think with this hilarious game from New World Games! As our regular customers know by now, Mike Petty usually does our designer interviews at Fair Play. When he had the chance to feature his own games in our Independent Designers Program special, I figured I better do the interview this time. Terry Carr: How old were you when you designed your first game? Mike Petty: I think it was sixth or seventh grade. I know it was the early eighties. TC: What game was it? MP: I don't remember what I called it, but it was a dungeon crawl. I had read a short article about Dungeons & Dragons. I had no idea what a role playing game was, but I was intrigued by the fantasy themes and the idea of getting treasure. I made a board game on the back of a cardboard box. It was very simple, rolling a die and moving around the board gathering weapons. It was also very luck based, but I liked it and remember playing it a number of times with my brother. TC: What do you like most about designing games? MP: Finding out someone enjoyed my game. Whether it's a successful playtest session or an email from someone who downloaded one of my freebie games, I am always grateful someone had fun with a game I created. MP: It depends on the game and how much depth I'm going for. Most of the time my games are tested by me and my wife in their early stages. If I need a more players right from the start, I'll try it with friends or my students at school. I have a clear picture of what I'm looking for in a game regardless of whether or not the initial tests are fun for everyone. If, after the initial testing and modifications, the game is still going strong, I'll play it with any willing group of gamers and get opinions. As you know, you and your wife have helped me a lot with several of my game designs. Both of my Black & White games were influenced by those early testing sessions with the two of you and my wife. TC: Do you try to get people from around the country to playtest as well? MP: I used to actively pursue this. I've found there are more people interested in getting a free copy of a game than there are people who will actually play it and give feedback! Of course, failed attempts may have had a lot to do with my poor game designs at the time too. At any rate, I have some friends around the country that I share my ideas with. Sometimes they'll just read the rules, other times they'll actually play the game. Either way I get valuable feedback from them. There have been some cases where I get email from people around the world who have played my free games I posted at an older game site. Freebie games never received all the playtesting they should have, so I always considered them playtesters as well. I guess it couldn't hurt to add that if anyone is interested in testing some of my nearly finished games, I won't turn away serious requests to help in that area. TC: What game that you designed do you feel is your best? MP: I believe a game should be judged in light of the designer's original goals. So, my best game is a card game called Dino Pics that I made for my daughter. She just turned three at the time. This was a card game where you supposedly go back in time and wait for dinosaurs to come to a watering hole. You snap pictures of as many as you can, but if you wait too long T-Rex comes and they all run away. She loves this game and asks me to play almost everyday. Her enjoyment has far exceeded my original expectations. In fact, I asked her a few weeks ago if she'll always play with me, even when she's in high school. She said she will, but I have my doubts. TC: What game do most people say is your best? MP: A negotiation game I made called King for a Day. Except for one case I remember, every person who has ever played it liked it. Production costs on this game would be beyond what I could pay myself, so I'm always looking for a publisher. With each rejection, I make a few changes and send it on again to someone else. I've learned a lot with the game and it always gives me satisfaction when I teach it to new players and they want to play again. TC: What was one game that you recall being your biggest flop? MP: There have been many. I think the biggest one I remember, in terms of how much I worked on it and how badly it went over, was a little trading game I called Haggle Finagle. You may remember it, since you played it that first and last time. We finished one turn and it totally died. No one asked me to try the next turn. There was no hope. I was in love with the title, though, and I kept working on games that would fit it. In fact, I think I've finally found a perfect fit and it may be a Black & White game by the middle of this year. TC: What do you do to a game that doesn't work at all the first or second time? MP: As I said, I have my own expectations in mind for a game regardless of how the first few playings go. If players completely hate the game, but I can see a mechanic was working the way I wanted, I'll do whatever I can to salvage that mechanic somewhere else. Almost every idea I come up with gets written down in a Word document that I can refer to later. If anything had promise - theme or mechanic - I keep it until I find someplace where it works better. TC: Approximately how many games have your started? MP: If writing down a very short, rough game idea is "started", then I'd say several hundred. If you count only playable prototypes, probably more like fifty to a hundred. TC: How many have you finished? MP: It's hard for me to say any game of mine is finished. I always can see tweaking things and trying to make it play differently in some way. Even my two Black & White games don't seem finished to me. I try to think of new games to play with the Yaddy-Yadda cards or variants and new cards for What's It To Ya?. As long as I keep playing them, I'm sure new things will turn up at the site offering more ways to play. TC: What game manufacturer do you want to produce your games? MP: Whichever one will take one! I hope that doesn't sound too desperate, but really I mean more to it than that. Working with publishers through Fair Play and as a designer, I've come to respect them very much. They have to be very good at what they do to be successful. If one of them finally decides to make King for a Day, for example, I know it will be because they believe in the game and they believe they can give it the best production to make it successful. What more could I'd hope for from any publisher? TC: Most people who know you know that you run a game club after school at the High School. What are some of your own designs that they have enjoyed? MP: What's It To Ya? has gone over very well there. It's a great game for getting to know each other and to express yourself. Teens, like almost everyone I suppose, really love to do both of those things. Other titles won't mean much to our customers, since the games haven't been published, but I'll mention a few notable ones. We've had countless hours of fun with a comedy RPG system I wrote. They've also enjoyed playing a bidding game called Fairy Bucks and a dice-fest-of-a-card-game affectionately referred to as Blaster Robots. TC: Finally, all game designers have dreams about making a great game that will make millions of dollars, but you know that doesn't happen too often. What are your realistic goals for designing games? MP: The short answer is that I want to see something good and significant come of my game designs. More specifically, let me put it this way. Nowadays I work on games mostly because I get lots of ideas for new ones. I love playing games with people as much as possible and I love learning new rules and mechanics. I find this naturally leads to my own, more or less, original ideas. It's time consuming to design a game-even just a playable prototype -but if I really have a decent idea, I hate to let it go to waste. I like to try it out. And so after putting in the time, I like to pursue whatever course will get the best games "out there" to as many people as possible and hopefully accomplish something I consider good and significant. To see an example of what I mean, take my Black & White Games. Both games I've done so far have proven to be very fun in their own way for the groups that have played them. They were also well-suited for an inexpensive production that wouldn't break my bank account. I decided to make my own versions and sell them for a very low price. The money I make from my Black & White Games is always given away to someone who needs it. You can read more about this at my website, but this is what I meant by accomplishing something good and significant. People who buy the games will enjoy them, but I hope something more lasting will also come of the work I put into them.